It’s the Cannonball Read 10 Holiday Book Exchange! I didn’t get ANY books reviewed this year (and because of stupid “1Q84,” I also didn’t quite meet my reading goal this year… I’ll probably only get to 49/52), but I love this community and still played the book exchange game! 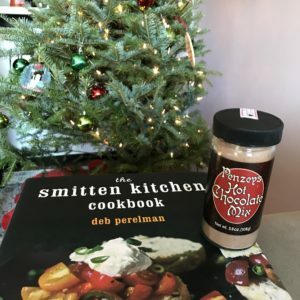 My amazing Santa, CoffeeShopReader got me the best gift, The Smitten Kitchen Cookbook, which, like, is even better because my Santa last year got me the sequel and I’ve been dreaming of buying the OG edition. Now it’s mine, all mine! She also threw in some hot chocolate, cause she’s the coolest!